By Gordon Frickers 35 x 48 cms (14″ x 19″), watercolour on paper, original by Sue Rees. The story behind producing the painting. Sue Rees said she was very impressed with the detail and quality of the paintings shown on this site. In her case time was of the essence, the new painting was to be a Christmas Surprise so time and budget were important aspects we soon settled. However, the only other water colours currently on www.frickers.co.uk/art at that time were “Mike Mac” and “Kim Stephens“, so this one was to be in very distinguished company! After initial phone conversations Sue sent me a series of still pics and initial payment..
A search for a suitable background commenced on Google for images looking for “Rhossili bay”, “Worms Head” and “Three Cliffs”, also in various Pilot books and other sources. Fortunately I have a file from 35+ years of painting that includes some piolet books and rare pictures of likley locations from around the world . Part of the problem with coastline is was to find good shots taken from the sea, most are from onshore. After a struggle we eventually found suitable illustrations thanks to Dr Michael Baker who is a very adept researcher and was the webmaster behind www.frickers.co.uk/art. We settled for a background based on 3 pics of Three Cliffs Bay, the first two from the sea side, the third from the beach side. 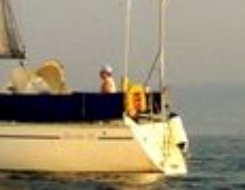 Sue radialted infectious enthusiasm and excitement during the process, sent some photos of the yacht anchored, sailing in a very light breeze and some of her ashore. Normally the client is not very involved once work starts, however Sue was keen and very helpful plus patient with my necessary, detailed questions. The photos supplied were of Hazlerigg in light winds, as is often the caes, all were from the wrong directions. The painting was based on this and similar photos. Attention was paid to the sea state and wind direction in relation to the yacht and her sails. 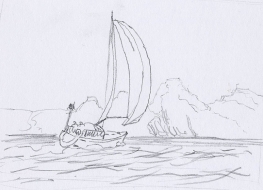 How far off the beach the yacht was to be was also a matter of fine judgement and took 2 more sketches. 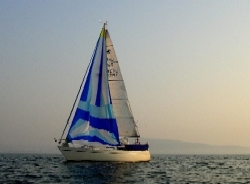 The wind is shown aft of the mean direction because of the effect of an apparent wind and importantly in this case, as a sailor knows the 3 cliffs would have bent the wind direction further aft so Hazlerigg is show with sheets more eased than one might at first expect. 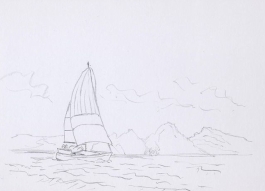 It was necessary to draw the yacht several times to get the movement, heal and pitch suitably lively. Sue was e-mailed sketches for comment and approval (pics 2 to 7 show this process). Sue seemed to enjoy being involved in the process. 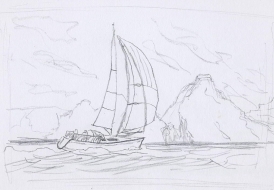 A sketch was also made of the background, 3 water colours were then drawn out and final corrections made. Once started, only one study went all the way to completion. Sketches 2 to 4 shown below were sent as attachments to be discussed. Pics 2 to 4 are development sketches looking at the overall issues. Pics 5 and 6 show two of the many necessary details extracted from the selection of shots sent. 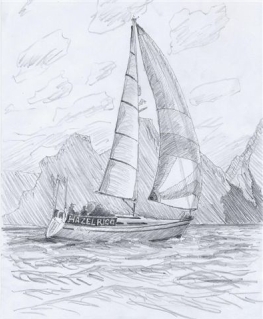 Eventually, developed sketch 7 was e-mailed for approval and the painting as completed was also e mailed. Meantime the original painting was sent for framing and delivery, on time in budget to become a unique gift that we hope will give many years of pleasure, more as time goes by, and will become a family heirloom. 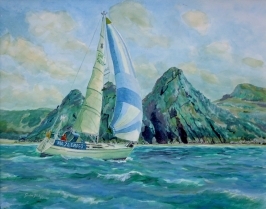 Final watercolour of Hazlerigg off the Three Cliffs.